I am sitting amid the golden splendour of this generous harvest of 1914. Field upon field of grain is spread out before me. All down this slope of the valley and all up the hillside opposite the ripe corn stands in stooks ready for the ‘leading’ as they say hereabouts – or the ‘carrying’ as it is called elsewhere. Along the road which traverses the foot of the valley a wagon heavily laden with its golden burden passes towards the homestead. I see it sway to and fro like a ship in a cross sea, and faintly hear the chatter of the men in charge. Over all is a percectly blue sky, with never a suspicion of cloud to fracture its perfection. Over all is a flood of sunshine. This, I muse, is England at its best – peaceful, happy, and contented England. And then a shadow crosses my mind, and the current of my thoughts turns to the terrible tragedy which is being enacted on the Continent. I think of that other harvest – a harvest of red, which is being garnered amid the roar of cannon, the crack of rifle, the thrust of naked steel, but a day’s journey from where I loiter among the golden stooks. It is awful to compare the two pictures: here a picture of peace, a picture of harvest time in this wonderful England of ours – there slaughter, slaughter, slaughter, and alas! things a hundred times worse than slaughter. When it came to the Boer War, horses were dying at an alarming rate. The bicycle’s efficiency had by this time been considerably increased. The feeling was that the bicycle would enable a soldier to move more quickly than on foot and would allow him to carry more. It also avoided some of the problems of horses – the need for feeding, and disease. The disadvantage of the bicycle is that it cannot withstand the recoil of a gun and riding requires such balance that even wielding a sword is virtually impossible. It is most effective therefore as a means of transport, taking people to places where they can fight, for scouting and for message-carrying. Bicycles have been used in the military for 140 years: their first use seems to have been in the Franco-Prussian War of 1870. In 1885, the British army began using bicyclists as scouts during Easter Manoeuvers, and in 1888 formally established the 26th Middlesex Cyclist Volunteer Corps. In 1887 the French army also formally added bicycles to military service in July, and by 1895 every corps and division was equipped with some bicycles. In the same year, Capt. Gerard made a folding bike for French infantry that could carried on a soldier’s back. For several years before the Anglo-Boer War the bicycle had been used in South Africa for para-military purposes and occasionally unofficially for military purposes but the real test of its usefulness in war was during that war. Colonel George Knox commanded the cycling section of the artillery at Ladysmith. Before the war he’d endeavoured to make cycling a part of the training at Aldershot. 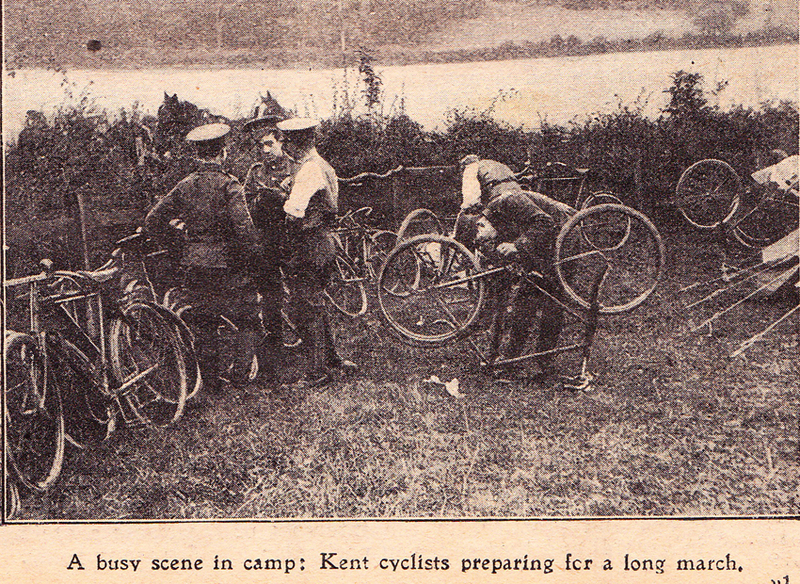 Consequently several cycling corps were ready for action when the war broke out. They were the City of London Imperial Volunteers (CIV) as well as two battalions of the Royal Dublin Fusiliers that were sent to South Africa. He received support from Kitchener for the use of cycles. Not everyone was convinced of the usefulness of cycles and some troops were coerced into using them. Six percent of British troops in the Boer War in southern Africa at the turn of the 20th century were on bicycles. The Cape Cycle Corps, formed in January 1901, was a unit of 500 troops. A commander usually had two cyclists as his orderlies to carry his messages. Cyclists would often ride ahead to act as a link between the cavalry and infantry, and would, at times, ride ahead to check suitable roads for the transport wagons and then ride back again to direct them. They were also used for reconnaissance of camping grounds for the regiments, and sometimes stayed behind to attend to the sick who were being transferred to hospital. 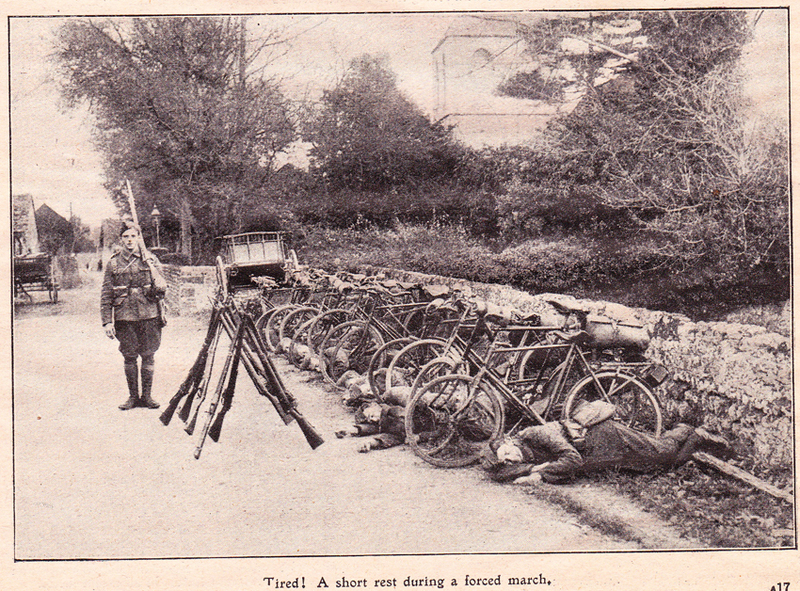 Even during an assault it was usual to find a cyclist or two with the leading ranks ready to carry messages. The cyclists were usually at their busiest carrying mail, telegrams, dispatches, money, stores, and even groceries in their Alpine rucksacks whenever a camp was established near a large town. A special ‘War Cyde’ was built for use on railway lines, and a prototype of this 8-man bicycle can be seen at Fort Klapperkop Museum. It was introduced into South Africa by the Royal Australian Cycle Corps and had a detachable rim which was fitted to the pneumatic tyres, enabling it to be used on rails. 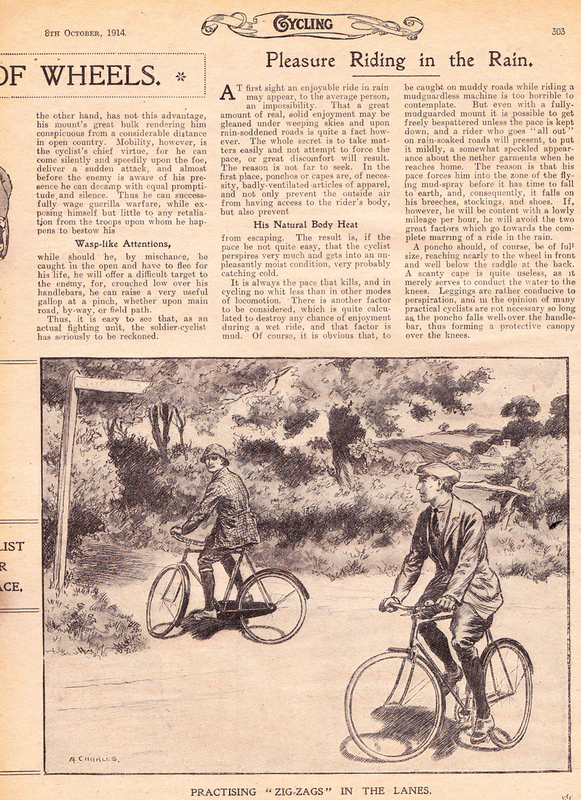 When the rim was removed the bicycle could be used on normal roads. These cycles were used for reconnaissance, for carrying despatches, checking the railway line for demolition charges, and also for removing the wounded from a skirmish taking pace near a railway. Extraordinary tasks were sometimes given to cyclists, one of which was to transport carrier pigeons. It was found that carrying them on horseback upset them, whereas they took more kindly to cycle transportation. 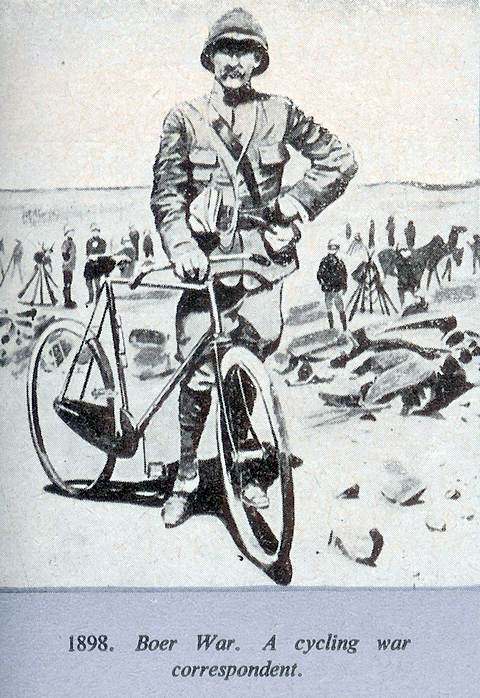 Scout Callister of the Cape Cycle Corps achieved great fame by ‘cycling 120 miles, gaining a vantage point, lying “perdu” (hidden) for several days, and then releasing birds whenever he saw Boer activity.’ Maj B.F.S. 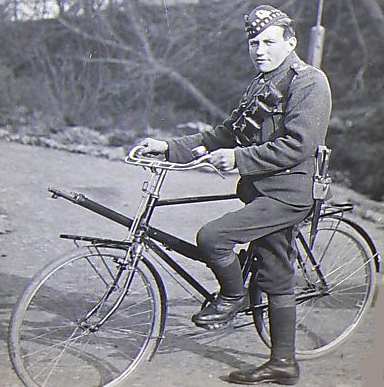 Baden-Powell of the 1st Battalion Scots Guards even had a collapsible bicycle which carried a kite. The kite was used at first for taking photographs of the camp by a remotely controlled camera, and later for raising an aerial for experiments in wireless telegraphy between Modder River Station and Belmont. Before the actual outbreak of hostilities cyclists were often used for what was commonly called ‘spying.’ A typical example was reported in the Diamond Fields Advertiser during the Siege of Kimberley: ‘Capt O’Meara, in pursuance of his enquiries as Intelligence Officer, was constantly to and fro, and in this manner obtained much valuable information as to the movements and probable intentions of the enemy. 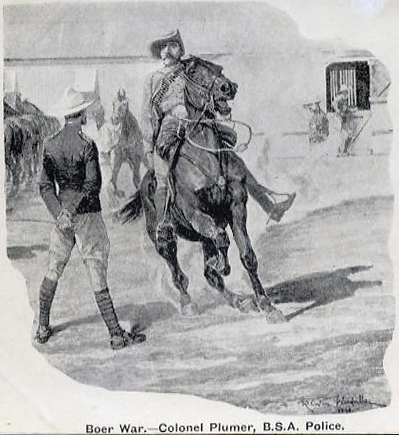 Riding into Boshof in the guise of an ordinary cyclist on the 22nd September (1899) he stumbled across a great gathering of armed Boers, and, after being rather unpleasantly shadowed, got back to Kimberley, bringing (the) first definite news that the Boers were on commando, and that warlike movements on the Western Border had begun. Boer leader Danie Theron formed his 108-man Wheelriders in September. The British formed the 1000-man City Imperial Volunteers. By 1901, 13,000 cyclists had served in the Boer War. South Africa was the testing ground for the bicycle in warfare, and it proved to be a most useful auxiliary to the horse. After the war the Royal Commission on the War in South Africa enquired into the usefulness of bicycles. The Americans were late adopters of military bicycles. After the Spanish War of 1898, Lt James A. Moss, U.S. Army, and a hundred black cyclists were rushed in to help with riot control in Havana, Cuba. They were laughed at and scorned but the amusement and chuckles soon died away when they proved effective. 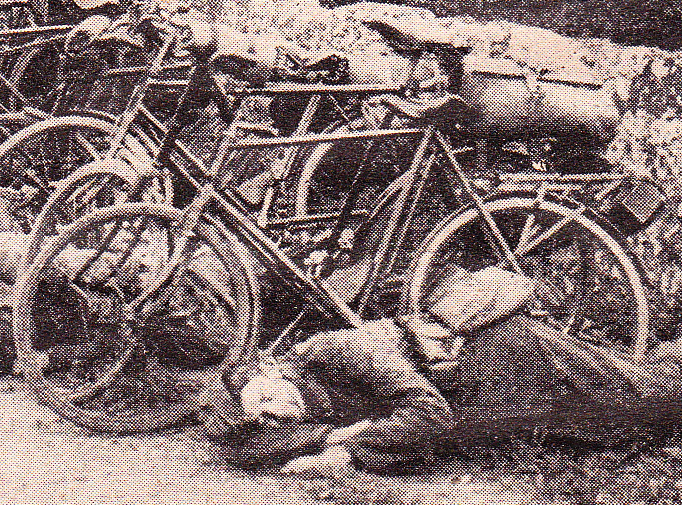 Rioting mobs were dispersed with ease by soldiers who moved in quickly and used their bicycles as barricades. Notwithstanding this success the American Army still hesitated to accept the bicycle as a machine of war. Bicycles were common during World War I. At start of the war, the British had 14,000 cyclists in a variety of bicycle regiments and battalions. In 1916, every corps was assigned 500 riders in three bicycle companies and, by 1919, the British had 100,000 riders. 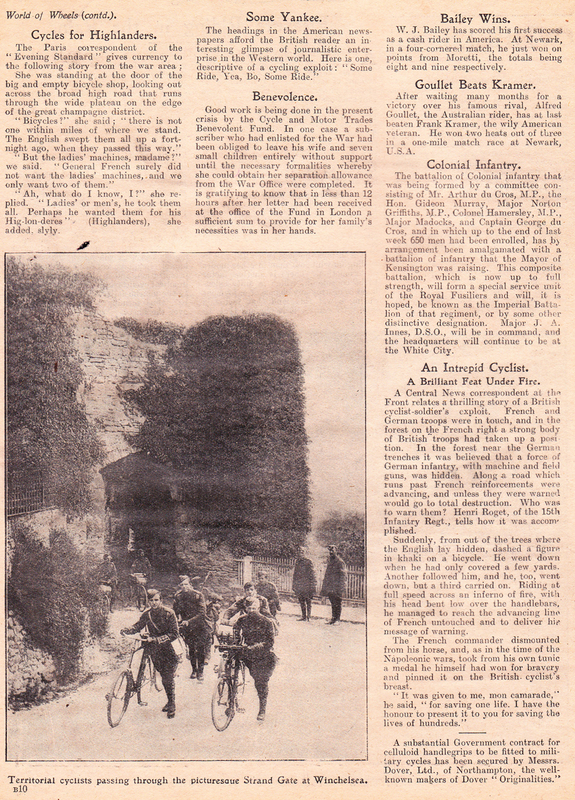 The London Cyclist Battalion patrolled the coast of England to watch for a German invasion. After air attacks began in May 1915, bicyclists with signs Take Cover warned British citizens to find shelter. 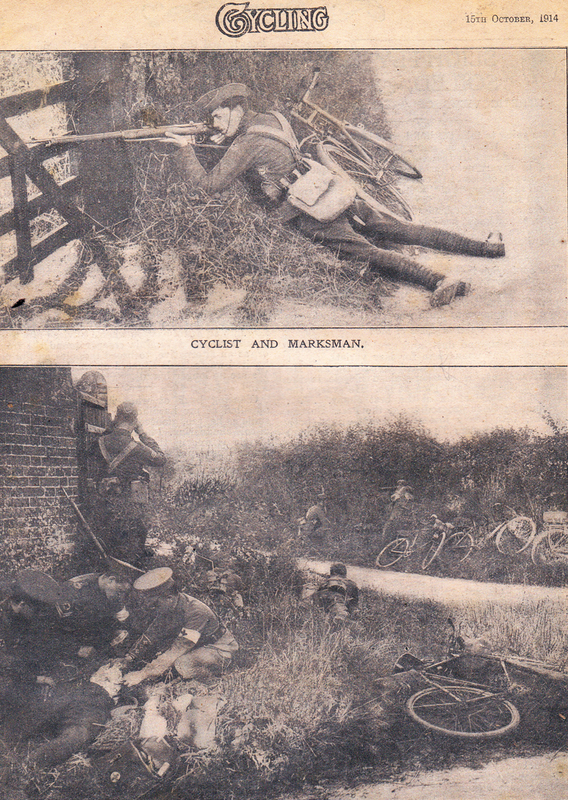 After Mons (23 August 1914), British and French cyclists fought rear guard actions, dismounting from bicycles and lying prone to fire weapons, then retreating quickly on the bikes. ITS POTENCY AS A STRATEGICAL AND TACTICAL FACTOR. By Captain. A. H. TRAPMANN, Adjutant, 25th (Cyclists) Battalion (County of London) The London Regiment. On Wednesday, 16th December, 1908. Brig.-General Sir H. S. RAWLINSON, Bart., C.V.O., C.B., p.s.c., Commanding 2nd Infantry Brigade, Aldershot, in the Chair. It is some three years since a paper on the subject of Military Cycling was last read in this Hall, by Major R. A. Johnson, now Brigade-Major of the South Midland Brigade. That these three years have been fruitful in changes in the evolution of the cycle as an engine of war must be my excuse for inflicting upon, the members, of this Institution another lecture on the same subject. Those who are cyclist officers, or who have kept closely in touch with the progress of military cycling, will doubtless call to mind the changes to which I refer; but I do not think that it would be out of place to roughly outline in a few words the past history of military cycling, both at home and abroad, before I attempt to deal with the present or the future of that branch of the Service in which many officers are so deeply interested, and of which many others, I regret to say, are so profoundly ignorant. In 1887 Colonel Savile, Chief Instructor of Tactics at the Staff College, Camberley, retiring from the Service, took over the command, of a Volunteer Cyclist Corps, 120 strong, which had been raised by Majors Carpenter and Hewitt, formerly of the Carabineers; he suggested that this new Corps should be designated the “Cyclist Guides” or “Cyclist Scouts,” which sufficiently denotes the duties which, with his great experience, both of military matters and of cycling, he thought this corps might most usefully perform. However, the authorities preferred to give this new regiment the title of “Cyclist Rifle Corps,” thereby implying that the men should be trained to undertake a very different role in war. I have elaborated this point, as I am desirous of showing how from the very start the aspirations of cyclist officers, even such an officer as Colonel Savile – an expert not only in cyclist work but also a professor of tactics at the highest military academy in this country – have been damped and overruled by those in authority – men who had no pretensions to be considered experts in at least one of these subjects. During the ensuing decade cycling became general amongst the civilian population throughout the country, and was no longer considered a sign of crankiness or misplaced enthusiasm. The cycle, however, was still an expensive luxury; it had not yet become an economic necessity to the masses. The result was that men with means or leisure invested in cycles. Many of these happened to be members of Volunteer Infantry Regiments; thus cycling sections sprang into existence throughout the Volunteer Force. 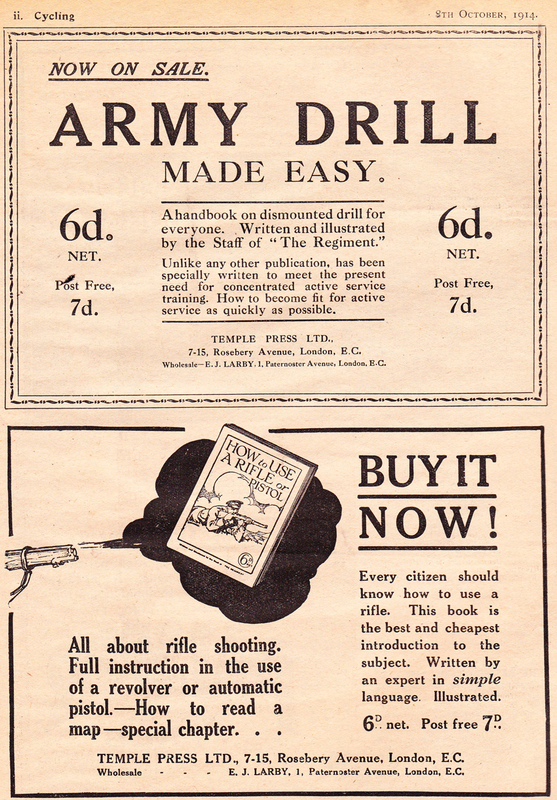 But the cycle was still too expensive an item to be indulged in by the men of the Regular Army. The hire – purchase system had not yet come into vogue. During this period France, of all the Continental nations, was the only country to turn her, attention to the cycle as an instrument of war. At first the cyclist was only looked upon as a carrier of messages. One enthusiast, Captain – now Commandant-Gerard, went further, and dreamt of companies of riflemen mounted on folding cycles, the latter being his own invention, of which, I intend to say more anon. 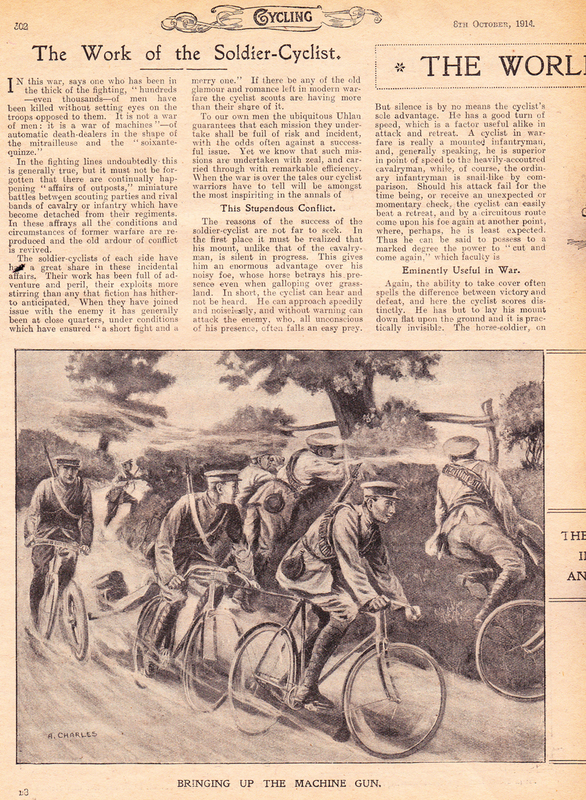 Certain French journalists, enthusiastic wheelmen, carried on a brie£ Press Campaign in favour of military cycling, but this gradually fizzled out, with the net result that each French Line Regiment had to content itself with a few cyclist orderlies. These Captain Gerard was wont to get together at the, autumn manoeuvres and endeavour to manoeuvre them as a company. In short, in the matter of military cycling, France was at the end of the nineteenth century exactly where Germany is to-day. England was still a little ahead. During the years of the South African War a tremendous wave of patriotism brought a great influx of recruits into the Volunteers. Battalions attained and exceeded their establishments, several, indeed, expanding into two battalions. Cycling was also becoming more popular amongst the civilian population. 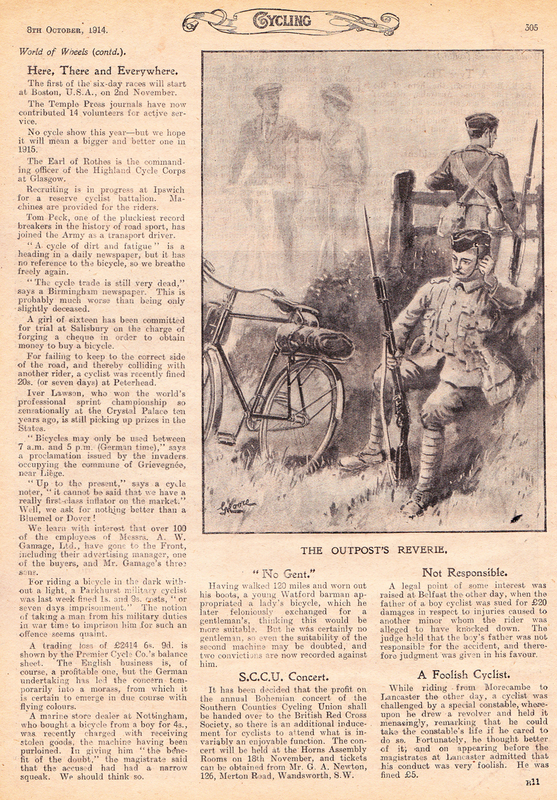 The joint effect of these two factors was that in most cases the cyclist sections of infantry battalions expanded themselves into cyclist companies, the authorised establishment of which was laid down as 1 captain, 4 subalterns, and 116 other ranks; at the same time, the establishment of the Cyclist Rifle Corps was raised from 120 to 240, and shortly afterwards to 361. There is a point here which I wish to make, as I shall have to refer to it later on. At the commencement of hostilities, Major C. E. Liles, commanding the Cyclist Corps, offered to take out 100 picked trained cyclists to the front. The offer was refused, and the 100 men who would have followed him to the front as cyclists had no alternative but to store their cycles and to enrol in the Yeomanry or Infantry Service Companies a – about fifteen of them also joined the C.I. V.’s as infantry – not even as members of the cyclist section, which was formed of cyclists from the infantry of the Inns of Court V.R.C. Now, I would ask you to note the sequel. Some months later it was considered desirable to raise three companies of Cyclist Volunteers for service in South Africa. These were, in fact, raised and sent but; but the point I wish to draw especial attention to is that the men of these three companies could in no way be considered as the equals either in training or as cyclists of the 100 men Major Liles had offered for service earlier in the campaign. A large majority of them had only joined the Volunteers since the outbreak of war, and practically none of them could be considered as trained cyclists. The reaction which set in on the termination of hostilities was felt more keenly, perhaps, by Cyclist Companies than by any other Volunteer units. Companies dwindled down to a vanishing point. In 1907, for instance, there were extremely few Cyclist Companies who could muster more than 2 officers and 6o men, and the average number was far below this. Now, in view of the recent abolition of Cyclist Companies, it may be of interest to dilate somewhat upon the result which this falling off in numbers had upon the efficiency of the individual officers and men. 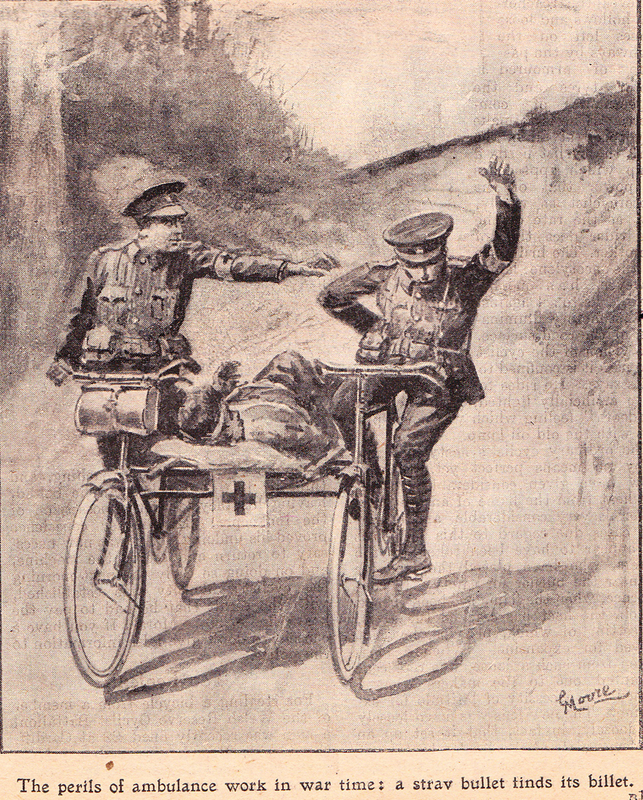 The Volunteer Cyclist was dependent, in order to attain efficiency, upon lecture in theory by his officers and practical training on manoeuvres. As regards to the theoretical part of his training, it was often the case of who would instruct the instructors themselves. The average Cyclist Company was commanded as often as not by an officer who had been pitch – forked into the command in order to suit the interior economy of the Battalion. It sometimes occurred, of course, that there would be an officer who was particularly keen on cyclist work anxious to take command; but even then there was but little to help him in his task of self-instruction. His brother officers knew little and cared less, if possible, about cyclists. The Adjutant not infrequently looked upon him and his company as a nuisance to be got rid of – to be sent off far away from the Battalion. There, were no text-books, no military cycling literature to which he could refer. As often as not he did not even have the advantage of a sympathetic fellow cyclist officer with whom to discuss and argue the, pros and cons of cyclist warfare. He had, in short, to evolve a complete vade-mecum of cyclist training out of his own mind. It is to be wondered at that many companies suffered: from lack of theoretical knowledge. On the other hand, the greatest credit is due to those. officers of Cyclist Companies, who, under these difficult circumstances, were able to teach their men anything worth knowing. The difficulties of practical training were almost as great. Under the old regime an officer considered himself lucky if he got 50 per cent, of his men present at any one parade. This immediately reduced the force available for tactical training on any one occasion to about 3o cyclists. When this force is divided into two in order to provide for an attacker and a defender, it will be seen that the possibilities of acquiring useful practical training were limited in the extreme, and that the opportunities of training men in the all-important duty of long marches by large columns were practically non-existent. True, it became the custom in several Volunteer Infantry Brigades during the period of training in camp to brigade all the cyclists together under the command of the senior cyclist officer; but the faults of this system were only too apparent. It not infrequently happened that the senior officer was by no means the most experienced. There was absolute lack of cohesion or esprit de corps. Dissimilarity of training and inter regimental jealousies did not tend to improve the situation, whilst frequently during the training this or that Cyclist Company would be taken away for one or more days in order to form a skeleton enemy for their infantry to operate against. All the defects of this system became apparent during the Cyclist Manoeuvres of 1906 in the vicinity of Salisbury, in which the Cyclist Companies of no less than six Brigades took part, and which lasted for three consecutive days. The Cyclist Manoeuvres of 1907, during which various companies were attached to the Cyclist Corps, bringing that regiment up to 500 strong, proved the value of the Battalion organisation for cyclists. In this case it may be worthy of mention that the operations were continuous for three days and nights, and that the enemy were supplied by cavalry and infantry units of the Regular Army. During the present year the whole of our cyclists have been reorganised. Companies have been abolished; in their place ten battalions of cyclists have been created, each battalion consisting of 8 companies of 60 men and a machine gun section; that is, 502 men and 21 officers – 523 in all, which total includes 22 motor drivers for 11 motor transport vehicles, 8 of which latter are imaginary and only used for mobilisation and documentary purposes. The primary duties of these Battalions is coast defence. Otherwise they are Army troops and are attached to Infantry Brigades for administrative purposes – a system which most of us trust to see simplified at an early date. Infantry Battalions are still permitted to retain a cyclist section, consisting of 1 officer, 1 sergeant, 1 corporal, and 12 men, for purposes of scouting and dispatch carrying. Meanwhile in the Regular Army the cheapness of the cycle has led to its popularity and incidentally to its use on manoeuvres in a modified degree. As scouts and dispatch riders their services have been found invaluable, notably in cavalry regiments, where their use has resulted in a great saving in horse-flesh and time. Turning to the Continent, we find that France still holds the lead, and has one permanent Company of Cyclists forming part of various rifle battalions, in addition to a liberal supply of cyclist orderlies and scouts in every regiment. The doings of the French cyclists at the Grand Manoeuvres this year will still be fresh in everybody’s memory, and I will not enlarge thereon, save to express a hope that some time in the near future we will copy the French idea of employing cyclists in conjunction with, or in the place of, cavalry. The Italians have during the past year turned four companies of Bersagleiri into cyclists, and also greatly increased this establishment during the manoeuvres. Large bodies of cyclists operating against cavalry also formed a feature of this year’s manoeuvres in Belgium. 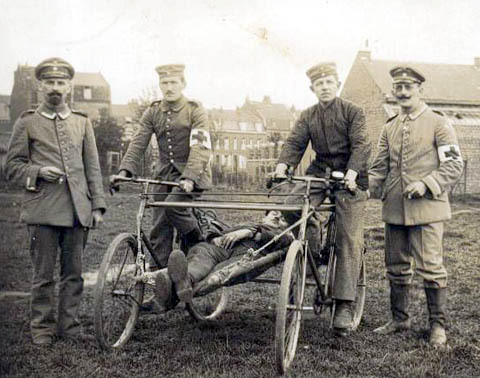 Germany is still a long way behind the above-named countries in the matter of military cycling, chiefly, I am inclined to believe, for two reasons: the German bicycle is a very inferior article; secondly, the German soldier is not physically well adapted for cycling. I have ventured to make a synopsis of the past history of cycling in the hope that my subsequent remarks may carry more weight; but before I enter upon the various Strategical and tactical effects which I maintain the advent of the cycle should produce, it is essentially necessary that I should make clear what I understand by the term “Trained Cyclist Soldier.” The definition which I am about to give is one, I believe, which is generally held to be correct by all cyclist officers, and yet it is a definition which I venture to think has not entered into the calculations of one out of every thousand officers of other arms of the Service. The definition which prevails generally might be summarised as “a trained infantryman who can ride a bicycle.” That is not at all my definition. I prefer to call that man a “Cyclist Infantryman.” I should no more dream of calling him a “trained cyclist” than the average cavalry trooper would refer to a man going through an M.I. course as a “rough rider.” I am desirous to labour this point, as I am under the impression that outside the Territorial Cyclist Battalions there are not a dozen officers who know what a trained cyclist is, nor what can be expected of him. The reason of this is that we are, a horse-loving people, and the class from which our officers are drawn are mostly born and brought up to the cult of horse – flesh. We know a great deal more about horses, and even motors, than we do about bicycles or riding them. Unfortunately for the cause of military cycling the bicycle is a useful adjunct of every – day life, and we have all learnt how to ride one. We therefore venture to look upon ourselves as cyclists, and when we consider the question of what utility men mounted upon cycles could be in actual warfare, we unconsciously take ourselves as a criterion of cycling prowess. We therefore in our ignorance say that cyclists are all very good on the roads, but are useless across country. We bewail the frequency of punctures, and we turn our minds to more profitable matters. I wish to point out most emphatically that the cycling capacity of the average gentleman, who rides a bicycle when compared to that of the trained cyclist soldier, is as futile and incomplete as the oarsmanship of the person who sculls about the Serpentine in summer time compared with that of a ‘Varsity oarsman. I am anxious that this point should be thorough appreciated. I want you to consider the case of the class of men from whom our Territorial Cyclist Battalions are recruited. The vast majority of them are well educated clerks with a fair percentage of skilled mechanics and tradesmen. These men in every -day life practically live on their cycles. Wet or fine they cycle up to business from their homes. In London the distance is generally a matter of five or six miles each way with plenty of traffic to contend with. Consider that to them expertness in cycling means so many extra minutes in bed of a morning; so much additional time to themselves on their return at night. Not only is their cycle their principal means of conveyance, but in most cases it is their chief source of relaxation. In my own Battalion we have scores of men who average 40 or 50 miles a day a – wheel; men who, when they go away for a week – end to the sea in Essex or on the South Coast, never dream of going by train; men who think nothing of taking a spin round Windsor Park before they start off to business in the City, just to keep themselves fit. The average gentleman only uses his bicycle as a means of transit for short distances, and is usually content to go round by the road; but the man who looks upon his bicycle as other men look upon their horse is not content to confine his cycling to the roads–he rides it over all sorts of country. Consider the value of this man when he is especially trained to ride over rough country, as is the case when he becomes a Territorial Cyclist. Personally, I can assure you after eighteen years’ experience in many countries, including the mountains of Wales and Spain and the delta and deserts of Egypt, that there are uncommonly few spots on the face of the earth where a good cyclist cannot ride. Even ploughed fields are rideable if you go with the furrow, and fields of standing grain, maize and clover invariably have negotiable tracks through them. It must be remembered that a track five or six inches wide is amply sufficient. Not only does this question of expertness a – wheel affect speed and render cross-country riding possible, but men who ride continually acquire great mastery over their machines, great rapidity in mounting and dismounting; facility in finding cover for themselves and their cycles. To give some, idea of what this means: A trained cyclist recently underwent some tests at Hythe over the grass and shingle tracks that intersect the ranges, which are by no means ideal tracks for cycling. In each case time was taken from the prone firing position at the start to the prone firing position at the finish. In addition, therefore to rising, attaching arms, mounting, riding the distance, dismounting, detaching arms, and assuming the prone position again, the cyclist also had to go through the loading motions at the start and at the finish. The official timing was: 750 yards in 79 seconds (or a fraction under 20 miles an hour); 100 yards in 21 seconds, and 25 yards in 5 seconds; the last named will perhaps give some idea of the capabilities of a trained cyclist. I doubt if it is generally known that it is nothing extraordinary for a cyclist to be able from the prone firing position to unload, rise, pick up his cycle, attach arms, mount, cycle 25 yards over a grass, and shingle track, halt, dismount, ground cycle, detach arms, lie down and load, all in the short space of 5 seconds. I should not be surprised if many people imagined that it took a trained cyclist nearly five seconds only to mount his cycle. But I have not yet completed my definition of the trained cyclist. Drawn as he is from the best of the middle classes, he is very quick at assimilating information. An endeavour is made to teach every man at least as much about scouting as is learnt by the trained scouts of infantry battalions; in addition to this, special men are chosen to undergo further instruction of a more advanced and technical nature. Add to these qualifications the fact that the great majority of the men are athletic, and when not cycling are wrestling, boxing, rowing, or playing football, and you will have a fair idea of my definition of a trained cyclist. It may also perhaps be of interest to note that the great majority of cyclists are practically teetotallers. As an example I may state that the battalion to which I belong, during the fortnight it was in camp, although there were 340 men under canvas, only managed to consume 18 gallons of beer. I put it to you that this is not a logical method of approaching the subject. During the past twenty years a new invention has matured which enables a soldier to go four times as fast and four times as far as he could possibly go on his feet. Is not this invention worthy of closer study than it has at present attracted? I will endeavour to prove that it is, but I will approach the subject in a more logical manner. I have just set forth the capabilities of the individual trained cyclist; I will now consider the capabilities of organised units of these cyclists. I will detail their advantages and disadvantages as compared with other arms. It will then be time to decide whether cyclists fulfil a long-felt want or can advantageously replace or supplement existing organisations. If not, then let cyclists be ruthlessly expunged from the Army List. But, on the other hand, if we find work for which cyclists are peculiarly adapted, then let us at once hasten to train them for that work, and let us also make known to other arms of the Service, through the medium of “Combined Training,” exactly what that work is. I will, for the purposes of this lecture, confine myself to the exigencies of Home Defence. A well-trained cyclist unit consists of a body of riflemen scouts capable of moving at an average rate of 8o miles a day (or 12 miles an hour for shorter distances) along English roads or lanes. In the case of paths and field tracks, these figures should be reduced by one quarter. A bicycle fitted for military service will cost about £8, and will last from three to four years. The cycle itself offers an infinitesimal target, seldom requires adjustment; when it does, adjustments can usually be made in a few minutes by aid of tools carried on the cycle. The cycle not only transports its rider, it is capable of transporting quite a considerable amount of impedimenta, which will add greatly to the comfort and independence of the men, such as blankets, waterproof capes, food, extra ammunition, and last, but not least, the rifle itself. It is an indisputable fact that a cyclist after an eighty mile ride in full marching order is, far less tired than the infantryman who has done his 20 miles, or the cavalryman who has done forty miles; and in the latter case I carefully abstain from referring to the feelings or condition of the horse. The cyclist does not suffer from sore feet, nor does his mount ever get out of condition. The longer a campaign lasts the fitter the cyclist becomes, the more capable of accomplishing longer matches with less fatigue. When on the move the cyclist offers a much smaller and at the same time more difficult target to hit than even the infantryman. He can ride behind hedges with body bent low and remain invisible, although moving still at full speed. His movements also are entirely noiseless. There is also one other advantage of supreme importance to a mobile force. The greatest war-master of modern times has said that an army marches on its belly. It is generally admitted that one of the most difficult military problems is the feeding of an army in war time. Now, the cyclist can not only without undue inconvenience carry three days’ rations in his valise, but he is also peculiarly well equipped for obtaining the last edible commodity from a country – side. If he finds himself in a place where food is unprocurable, it is no great hardship to him to cycle an additional ten miles or so to a more hospitable neighbourhood. Large cyclist units in a sparsely provisioned area could break up into small detachments, scatter several miles in search of food, and concentrate again when the commissariat stores had been replenished. Even in the most rural portions of England a Cyclist Battalion should be able to live on the country in which it is operating, irrespective of supplies carried by its own motor transports. Now let us glance at the reverse of the portrait. When the cyclist leaves the, road his speed is greatly reduced; but this is also the case with every other arm of the Service. In a close country like. England, intersected by neither hedgerows, ditches, and fences, neither artillery, cavalry, nor infantry will even approximately attain the prescribed average rates of speed laid down for those, arms when marching across country. Exception may perhaps be made in the case, of Salisbury Plain and the Wantage Downs; but those are not localities which an invading army is likely to visit, and moreover I have cycled over every mile of these localities and I am prepared to assert that although b no means ideal country for cyclists, there is no portion them of where trained cyclists could not move at the rate of eight miles an hour. I trust that this assertion will give food for thought when considering the possibilities of cyclists in even a Continental theatre of war. Another disadvantage frequently imputed to the cycle is its liability to puncture, its liability to skid on muddy roads. After all a puncture is not a very serious matter, and any cyclist worth his pay should be, and is, able to repair the damage in ten minutes at the outside. Here again I would animadvert to another incidental advantage. In slow – moving arms, more especially in the case of infantry, a man who once falls out has very little hope of rejoining his unit until the end of the day. It is different in the case of the cyclist, where the flexibility of pace is so great. I will illustrate my meaning. Given a Company of trained cyclists, the average tiding pace of each individual man will probably be 13 or 14 miles an hour, and say 17 or 18 miles per hour at full pressure. That company, when route marching, will probably not average much more than 10 or 11 miles an hour. A man therefore who, falls out to mend a puncture will rejoin his unit just about 24 minutes after he fell out and at distance of about 4 miles beyond the point where he punctured. Under these circumstances a puncture can hardly be considered as such a serious stumbling block as, most critics would imply. Added to this puncture statistics, carefully compiled during several years’ experience, tend to show that a man has a puncture on the average once in every 210 miles. There are not many arms of the Service, I venture to suggest, where a man can boast that he has not been absent from his place in the ranks for one reason or another for less than 24 minutes in a march of 210 miles. The question of skidding on muddy roads is purely a question of capable riding. I do not mean to imply that trained cyclists never have side – slips; such a contention would be puerile. But I do contend that trained cyclists do not fall off or come down when their cycle skids – it is merely an unpleasant moment, much the same as when an expert rider’s horse suddenly shies in the midst of a gallop. The only other drawback that I have heard alleged against the cyclist as a military factor is that cyclist columns cover an inordinate, length of road space This contention is, partly true, partly exaggerated, and the whole of the truth is not stated. It is perfectly true that partially trained cyclist units tail out to inordinate lengths. The new Cyclist Training, 1908 (provisional) lays down that cyclists should ride in file with a distance of 12 feet between succeeding files. Those of you who have had any experience of well – trained cyclists will bear me out when I say that this distance is quite unnecessary and unusual. Except when riding down a steep hill or in a very up-and-down country, it has been the endeavour of cyclist officers to make their files lock up to a distance, of one foot, or at most, one yard, and this endeavour is successful if the men are properly trained and officers and non-commissioned officers do their duty. This will give a road space for a Battalion on the march (allowing intervals of 10 yards between, companies) of about 800 yards. I admit that this would on the first glance appear. excessive, but it must be borne in mind that this road space is only occupied for a very short period – three minutes at most owing to the rate at which cyclists travel, and that the rear man could deploy on the alignment of the front file in just as short a space of time as could the, rear four of a battalion of infantry marching in fours, even if the infantry moved at the double. It will be observed that in dealing with the alleged disadvantages under which cyclists are supposed to suffer I have had frequent recourse to the term “trained cyclist.” It was for this same reason that in the earlier portion of my lecture I dilated somewhat lengthily on the qualifications of the trained cyclist. As regards the untrained cyclist, I have no more use for him than the average critic of military cycling has for the trained cyclists, of which he knows so little. The partially-trained cyclist is not only useless, he is a waste of the taxpayers’ money, a danger to himself and to any troops in conjunction with which he happens to be acting. It is possible that in the discussion which will follow on the conclusion of this lecture someone will endeavour to refute some of my arguments by adducing the instance of the cyclist companies who fought in South Africa. My reply is – and I have it on the best authority, namely, that of an officer who commanded one of these companies, and who was subsequently attached for several years to the Cyclist Battalion to which I have the honour to belong – that the men who composed those Cyclist Companies were, in comparison with the men of the battalion in question, only partially trained. Having set out, then, the capabilities of properly trained cyclist units, let us consider their Strategical and tactical potency for war. It will not be necessary to deal with cases in which their utility has already been recognised, such as despatch carrying, seizing of defiles, scouting for infantry, and coast defence. As information on these subjects can be obtained from the newly published text-book, I propose rather to lay before you other vistas of employment which have not hitherto been recognised as peculiarly suitable to cyclists. Firstly I submit for consideration that cyclists are peculiarly adapted for staff work, more especially for that portion of staff work which deals with the acquisition of information of the enemy’s movements during the progress of a campaign. A general officer commanding an army in war time is dependent on various sources for information of the enemy’s movements. Most of these sources, being civilian, are unreliable. History has repeatedly proved that the STRATEGICAL cavalry, military officers in disguise, and special reconnoitring patrols led by a staff officer in person are the only reliable means of gathering accurate and useful information. The first method is costly, entailing an extravagant wastage of horse – flesh, and is an improvident use of large bodies of cavalry which we, for instance, could ill spare, considering our weakness in this arm of the Service. The second alternative is one that does not commend itself to British officers, whilst the third expedient necessitates the absence (and risk of capture) of those very officers whom a general would be most anxious to keep about him to sift the intelligence reports brought in through other channels. If such work as this were entrusted to specially raised companies of Cyclist Scouts, who were trained in peace time to the niceties of secret service work, and were educated in all the details of the organisation, uniform, etc., of foreign armies, officered by men who thoroughly understood what information was most required and the best means of obtaining it, I venture to think that the, duty in question would be satisfactorily performed with far less cost of life and with far greater accuracy and speed than is provided for under existing arrangements. It may be argued, admitting that this employment of cyclists is sound, that it would be easy on the outbreak of war to commandeer a company of cyclists for this purpose from the nearest Cyclist Battalion. Such an eleventh – hour expedient has disadvantages so obvious that there is no need for me to name them. It must also be borne in mind that officers commanding Cyclist Battalions are but human, and that they would hardly be likely to detail their best officers and men for this extra regimental duty, whilst it is clear that nothing short of the best would be of any good at all. If it is considered that companies of specially trained cyclists would be valuable in this connection, these companies should be raised in peace time, say one in each command, performing part of their annual training with the nearest Cyclist Battalion and part thereof at a staff ride held by the G.O.C. At other times they would receive instruction in their peculiar duties from staff officers, and their officers might acquire much useful practice by engaging in secret service work. A certain number of motor cyclists would of course form part of the unit. Each man would be required to pass an examination annually in such subjects as the equipment, organisation, and clothing of foreign armies, military sketching and topography, photography and telegraphy. A small bounty might be paid annually to those who qualified in this examination. 1. The garrisoning of an area temporarily deprived of military forces, but liable to incursion by the enemy. 2. In conjunction with STRATEGICAL cavalry. 3. To make incursions into areas held by the enemy. 4. To operate against the enemies’ lines of communication. Taking these four cases in the above order, I ask you to consider the case of what provision would be made for the garrisoning of Scotland, the North and the Midlands in the event of a hostile landing in force in Kent and East Anglia, in the conceivable event of a large proportion of the Regular Army being abroad? We have been told ad nauseam that our Territorial soldiers are totally unfit to meet equal numbers of foreign conscripts; it may therefore be taken for granted that every available man would be wanted in the area of hostilities in order to make-up in numbers what we lacked in efficiency. On the other hand, both from a military and political point of view, it would be impossible to totally denude the Midlands and the North of troops for fear not only of another landing or a cavalry raid, but also of local rioting. Considering the-great extent of country to be thus garrisoned and the probability that railway communication would become impracticable, it would either be necessary to leave very considerable numbers of troops distributed throughout the area or to employ a relatively insignificant number of mobile troops, such as cyclists, at places within 24 hours’ march – say 100 miles of each other, thus setting free for service at the front great numbers of troops who otherwise would have to be retained on garrison duty. In a recent number of the “Cavalry Journal” I have dealt at some length with the subject of the employment of cyclists in conjunction with cavalry, strategically and tactically. It will suffice to summarise in this matter. I suggest that the attachment of a Cyclist Battalion to the STRATEGICAL cavalry would not only vastly increase the range of operations of these latter, but would also greatly increase their fighting value in the event of collision with the enemy; and I suggest that the fact that this additional fighting power was at hand would increase the moral of the STRATEGICAL cavalry, and thus enable them to push on and undertake enterprises which they might not otherwise feel strong enough to embark upon. The cyclists also might be employed in this connection to create diversions and distract the enemy’s attention from the movements of the cavalry; or again, they might also be pushed on far in front to cover the movements of the cavalry; in other words, the Cyclist Battalion might perform the same services towards the STRATEGICAL cavalry as these cavalry themselves were performing towards the army. My third and fourth points may be dealt with together, namely, the making of incursions into areas held by the enemy and raiding his communications. In this connection I submit that the long – distance marching power of cyclists is in itself a factor of great STRATEGICAL value. The fact that in 24 hours cyclists could cover 100 miles would be likely to get on the nerves (and so affect the, moral) of small detached columns and garrison posts. A few dashing cyclist raids at the commence, merit of a campaign, even if unproductive of tactical results at the time, could not fail to impress an enemy with a sense of insecurity and force him not only to greatly increase the number of troops on his lines of communications but also to increase the size of detached columns and the escorts of convoys, and thus reduce his striking power at the front. In the latter stages of the Boer war we had many excellent examples of what a few hundred mobile men can do to upset the calculations of a relatively enormous garrison distributed over a wide area, and the incalculable damage that they can inflict in the matters of moral and prestige, not to mention more tangible results, and these results were obtained notwithstanding the fact that we had in South Africa large numbers of equally mobile troops wherewith to cope with the wandering Boer commandoes. Now, a Cyclist Battalion in England would be infinitely more mobile than even Christian de Wet at his best, and at present there is no Continental Power possessed of equally mobile troops wherewith to hound them down. To give an illustration of my meaning I will ask you to consider the possibilities of an imaginary situation, and one in which I place the cyclists in an infinitely more difficult position than our Cyclist Battalions would occupy towards an invading army. Imagine that the ten Cyclist Battalions of the Territorial Army do not exist. Imagine that to – night three battalions of well-trained cyclists were to invade our islands, landing respectively in Forfarshire, Yorkshire, and Dorset. I want you to consider what steps would be necessary with the whole of the Home Army at your disposal to bring those Cyclist Battalions to bay and force them to surrender. I ask you to consider how many days it would be likely to take to effect their capture; and, lastly, I ask you to attempt to form an estimate of the immense damage to prestige, life, and property those fifteen hundred men would have done in the meanwhile. I think you will find that the more deeply you go into the details of this imaginary raid the more feasible it will appear to you. I venture to add that I believe the easiest solution of the situation would be to mount large bodies of infantry on commandeered bicycles, for railways and telegraphs would be tampered with, at all events within the zone of action of each raiding party. I will now deal with cyclists from the tactical aspect; but before entering into details I am anxious to point out that I deprecate the employment of cyclists in the firing line when other troops are available in sufficient quantity to obtain the desired objective. The cyclist is, or should be, too valuable. Immobile in the firing line, he can only be counted as one rifle; on the flanks or rear of the enemy he becomes an unknown quantity, menacing retreat and communications. There are circumstances in which a commander would be justified in sacrificing his cyclists in order to obtain some definite object; but it should be taken as an axiom that when two armies are joined in battle the cyclists should be withdrawn from the firing line and replaced by infantry. It would be sheer waste to risk the most mobile troops in a situation where they become totally immobile, and where less mobile troops, such as infantry, would attain equally good results. In a battle in which all arms are engaged the objective of the cyclists should be the extreme flanks and rear of the enemy. In the event of victory the enemy’s retreat will be greatly hampered, more especially by the shooting down of gun teams withdrawing from the action, and by the successive occupation of defiles and of commanding positions. In the event of failure of their own side to attain success, the cyclists could greatly impede the movements of the enemy’s reinforcements, more particularly the replenishing of hi’s ammunition supplies. 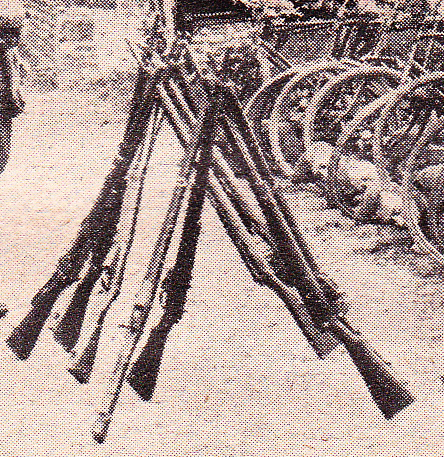 When acting on the defensive in conjunction with a force of all arms, cyclists might be employed either with the general or local reserves, being held in readiness to rapidly reinforce any threatened portion of the firing line, or else to hold until the last moment some outlying work or post in advance of the general line of defence. They might also be usefully employed like machine guns, to hold salients. But a far more legitimate use for the cyclist would be to employ him far out on the exposed flank. Here he would be in a position to outflank any attempt of the enemy’s to turn the flank of the main position, and yet, owing to his mobility, he would be capable of being brought back to join the main defence if circumstances rendered this course advisable; also there would be no fear of his being cut off, owing to his speed of movement. In tactical conjunction with cavalry, cyclists would prove invaluable as a rear guard, securing these from pursuit by hostile cavalry. I do not-think that even in England cyclists could advantageously supplant mounted men in the duties of protective cavalry, but I am of opinion that in the cases where large bodies of troops are concerned, the addition of a Battalion of Cyclists to the protective cavalry would prove of great assistance, not only to the cavalry themselves but to the troops protected. They would be admirably adapted for the purposes of forming a flank guard or an advancing screen ahead of the columns, or it must be remembered that a Cyclist Battalion extended over a front of 20 miles can concentrate in 40 minutes at a central point, or at either flank in about 1 hour and 35 minutes. I have one other suggestion to make as regards our own cyclists, but I am afraid that the proposal is so unorthodox that it may not be taken seriously. The suggestion is that a force which contained a sufficiently large number, of cyclists might, except when actually in the face of a hostile force, almost entirely dispense with night outposts. It will be admitted that an enemy making a night march or night attack – at all events in England would be obliged to keep to the roads until it approached close, to the bivouac. The scouts of this force also would not begin to work across country until they were within 5 or 6 miles, at most, of their objective. I suggest that a weak screen of standing cyclist patrols watching all roads at a radius of, say, 10 miles from the camp would secure the same immunity from surprise as would a large force of, infantry on outpost. If each standing patrol were also furnished with a motor cyclist to give early warning of any hostile movement, I maintain that this warning would reach the camp at least two and a half hours before the enemy’s infantry, or one and a quarter hours before the enemy’s cavalry; much longer warning, at all events, than would be secured by an ordinary outpost line. I need- not enlarge upon the great boon which immunity from night outpost duty would confer upon the column, enabling it to make much longer marches by day. At the same time, it would be no hardship to the cyclists, provided always that in addition to this duty they were not expected to undertake extensive other duties during the day. 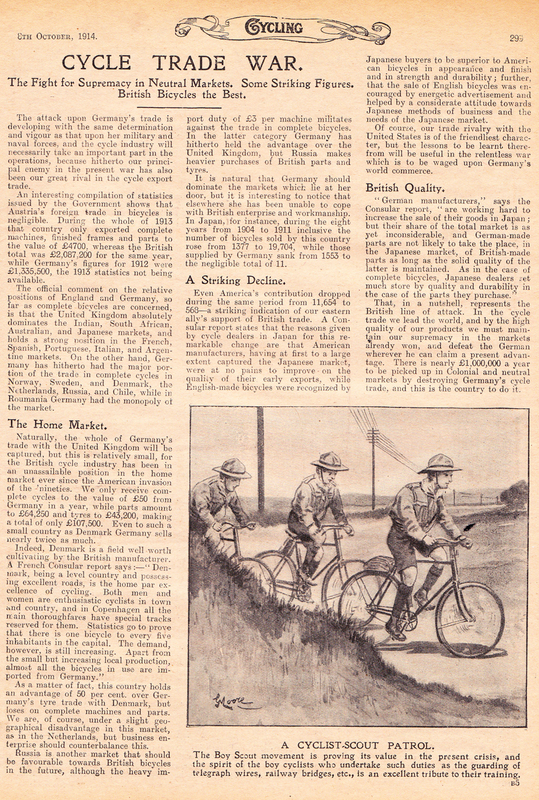 It may be of interest here to note the views held on the Continent as to the employment of cyclists; but before doing so it is necessary to emphasise the fact that in no case do Continental military cyclists attain anything approaching the cycling powers possessed by the expert cyclists of our own Territorial Army. This fact necessarily narrows the field of their utility. France, until this year, looked upon cyclists as infantrymen, who mounted their cycles when the country was favourable. This year she has experimented with them, and with great success, both in conjunction with and also in lieu of STRATEGICAL cavalry. Germany looks upon cyclists as Army Corps troops for purposes of supplementing the divisional protective cavalry. Belgium is inclined to allot to them the roving commission of free-lances, for the purpose of, raiding the enemy’s communications. Italy remains undecided whether to use them as contact squadrons or as frontier guards. Before I conclude my lecture I desire to make a few suggestions as to equipment and organisation, which, in my opinion, would tend to increase the efficiency of our Cyclist Battalions. Firstly, there is no provision in the present establishment for motor cyclists. These I consider are absolutely indispensable for the purposes of carrying information and despatches rapidly from one body of cyclists to another. They are totally unsuited for scouting or joining the firing line by reason of their unwieldiness, liability to get out of order, and the noise they make; but they might very frequently replace signalling communication. There should be not less than 20 in the normal establishment of every Cyclist Battalion, 2 with each company and 4 with headquarters. 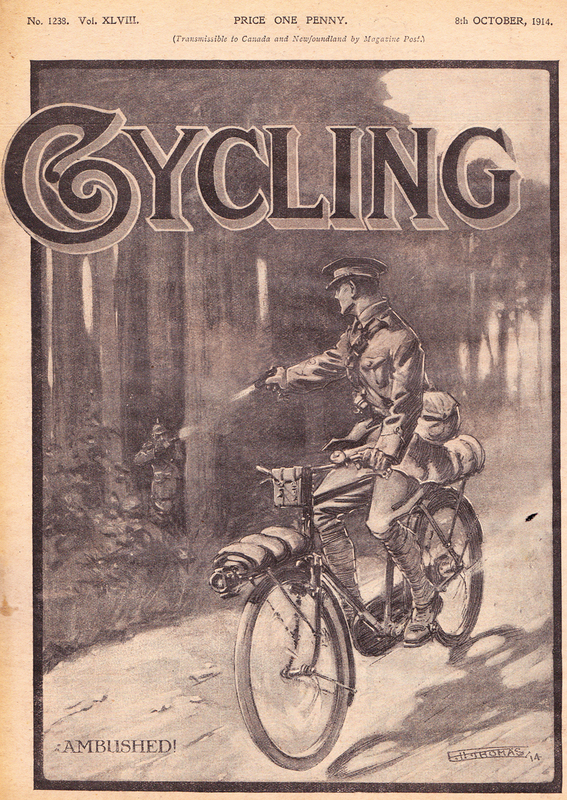 Secondly, each Cyclist Battalion possesses (on paper) two machine guns. It is proposed to supply these with motor transport. Some twelve years’ experience of a cycle – drawn machine gun has convinced me that this latter is the more suitable method of traction, provided that the new light – weight Maxim, together with the M-ark IV tripod, can be served out. It is easy to design a light carriage on the principle of a trailer which would carry the gun ready mounted on its tripod, and all that would be necessary to bring it into action would be to lift the tripod bodily out, releasing it from a spring catch. While considering this question I would commend to the notice of tacticians the possibilities of cycle – drawn machine gun batteries of 8 guns, the attachment also being mounted on cycles, forming a portion of the divisional troops. The Maxim is essentially a weapon of opportunity, and the more speedily the gun can be transported from place to place the more opportunities are likely to be available. The progress also of wireless telephony is being closely watched by cyclists in the hope that, when efficient working over distances of about ten to twenty miles has been secured, Cyclist Battalions will be allowed to add a wireless telephone section to their establishment. As regards armament, it may not be generally known that in future cyclists are not to be provided with bayonets. It follows that there is no longer any excuse for not issuing to them the new short rifle, which would be a far handier weapon for them to carry on their cycles than the present L.E. rifle. But if cyclists are to be deprived of their bayonets, I wish. most emphatically to say that some other auxiliary means of defence should be supplied to them. In war time cyclists will have to incur tremendous risks; they will have to be very daring, both individually and collectively, in order to obtain the best results. The cyclist will not be very daring-it is contrary to human nature-unless he feels confidence in himself and in his means of defence. I suggest that every cyclist should be armed with a revolver. He may seldom have occasion to use it, but its mere possession will give him great confidence, and to obtain information he will venture in areas infested with the enemy’s cavalry patrols, which otherwise discretion would counsel him to leave severely alone unless he wished to be cut down by horsemen whilst riding along defenceless upon his machine. There are, more especially on the Continent, critics who advocate the use of the folding cycle for military purposes. I cannot but believe that these must mostly be people who have never ridden a folding bicycle. It is heavy, lacks rigidity and strength, entails loss of time in folding and unfolding, and even when it has been folded and is strapped on to the back in such a manner, by the way, that it cannot possibly be unstrapped except by the assistance of a comrade, it is the most unwieldy burthen I have ever carried. The advantages claimed for it, even if real, would hardly compensate for these drawbacks; but the advantages are theoretical rather than practical. It is claimed that cyclists when they wish to cross fields, etc., will dismount, fold their bicycles and stow them on, their backs. I was once the proud possessor of a folding bicycle, which I used for experimental purposes, and I can assure you that fur half a dozen excellent reasons nothing would induce me to take one on service, or if I did it would never be folded except when the spring got out of order and it collapsed automatically, which is one of its unexpected habits. The only real advantage which can be claimed for it is the facility with which it can be stored or transported by rail. I take it, if ever this country were invaded, those railway systems which were intact would be congested by the transport of slow moving units, and that cyclists would have to move by road. Lastly, I wish to animadvert to a question of training. There can be no real efficiency without cohesion; cohesion is only obtainable by similarity of training. It is not sufficient to lay down in a small official volume the general lines on which training should be carried out; it is essential that all Cyclist Battalions should train alike in every detail. To attain this end two things are necessary: a class of instruction for young cyclists officers and a central cycling authority. This latter want could be supplied by the appointment of a competent officer as Inspector – General of Cyclists. It would be part of his duty to assimilate the training of all Cyclist battalions, and also to attend to those matters which are dealt with by Brigade Commanders in the case of infantry. It is important, I venture to think, that this officer should combine with other necessary qualifications an experience and a knowledge of cycling and of cyclists’ capabilities, requirements and duties, at least as great as, if not greater, than that possessed by the officers of the battalions it would be his duty to inspect and supervise. At the present moment cyclists is the only arm of the Service in which we are better supplied than the armies of other nations. Let us at least maintain this lead. I put it to you, under existing circumstances is not the study of the tactical and STRATEGICAL potency of the cycle in warfare incumbent, upon officers of all arms of the Service? Is not the cycle as an engine of war worthy of greater consideration than has been accorded to it in the past? Colonel T. STURMY CAVE (Commanding South Midland Brigade):-In the few observations that I have to make, I hope my friend Captain Trapmann will not think that I do not entirely appreciate the value of his paper and his zeal and ability as a cyclist officer, of which I have had experience, as he was on my staff at the cycle manoeuvres in 1906. I do not, however, think he takes a sufficiently broad view of the cyclist in war. He seems to desire to confine the energies of the cyclist in war to isolated cyclist battalions. What has recently taken place in reference to our 2nd line military cyclists is as follows : There existed in the Volunteer Force 8,ooo cyclists, who were all members of cyclist companies of infantry battalions, with the exception of about a couple of hundred who belonged to that cyclist unit of which Captain Trapmann is so excellent an ornament. We had 8,000 men available. All these have been disbanded with the exception of Captain Trapmann’s 200 and 2,800 have been enlisted in cyclist battalions with an establishment of 5,230. Now, if these cyclist battalions are to efficiently perform the role that Captain Trapmann has sketched out for them, and that appears to be contemplated in the text books recently issued by the War Office, instead of there being 3,000, which is the present strength, or even 5,230, which is the full establishment of the 10 battalions authorised, there should be a hundred battalions, with an establishment of 50,000. Surely this will be necessary if they are to form a watching line along the coast of Great Britain, or even confine themselves to those portions of the coast where landings are available. Although I wish every success to the 10 battalions authorised, I say that even a good thing may be purchased at too high a cost. If it be that this impoverished country cannot afford the few shillings that are necessary for the cyclist companies of the infantry battalions and for these cyclist battalions as well, then I cannot help thinking that it would be much better to devote its money to the cyclist companies of the infantry battalions; nay, I am convinced that from a broad military point of view the country which sees the desirability of every infantry battalion having its cyclist company, of every cavalry regiment having its cyclist company, and of every brigade of artillery having its cyclist company will greatly increase its military efficiency. It is, so to speak, a very cheap organisation, because the cycle eats nothing, it costs but little, and it takes up very little stable room and accommodation. All it wants is a small pot of oil and a few patches of India – rubber to repair the tyres. I feel convinced that the country which adds to its establishment these cycle details to every one of its arms will score enormously if it meets an enemy that has not taken that advantage. I am very glad indeed to hear that other Continental nations have not taken that step, and I hope that our own authorities will have the wisdom to do so before, long. Captain Trapmann alluded in one portion of his lecture to the advantage of cyclists co – operating with other arms. I cannot help thinking that both in scouting and in screening we can apply the word “screening” to all the advance guards and rear guards and flank guards and outposts they will be immensely, valuable; but if the force that is to be screened has its own units, its own comrades to do it-as with the old cycle companies – it will be a very great advantage. Captain Trapmann has alluded to the cyclist manoeuvres in igo6. I had the honour of commanding those manoeuvres, and Captain Trapmann was one of my staff officers. He says that all the disadvantages of the regimental system of cyclists were then shown to exist. I beg to disagree with him entirely. There was one very great advantage which was shown to exist, and that was that 1,200 cyclists came forward and took part in those manoeuvres. They demonstrated many things that were necessary. They demonstrated, in the first place, the desirability of similar manoeuvres in 1907 and in 1908, which I very much regret to say we did not get, because during those two years an effort was going on to limit and stop and cut up these infantry battalions in order to make the cyclist battalions. That, I think, was a very great pity. Those manoeuvres demonstrated the desirability of cyclists always co – operating with other arms. We very greatly felt the want of mounted infantry in those cyclist manoeuvres. Cycles get on excellently as long as they have to be ridden over grass or on the plain or along the beautiful roads that you always find in England; but when it comes to a stretch of moor or heath we felt very much indeed the want of men mounted on horses, and if had been’ possible to have had a couple of batteries of horse artillery as well, we should have found still greater advantages. To my mind, for strategic and also for tactical operations you want a combination of all the arms; the idea of cyclists operating independently is a mistake. The greater variety we can get, and the more completely we can get all our arms to co-operate together, the better they will be able to fulfil their military functions. A splendid organisation of cyclists would be a section with every infantry company and a section with every battery forming part of the company or battery. These would form a company as part of every battalion of infantry and brigade of artillery. So far as the infantry organisation is concerned, when the brigade commander desires, his four companies can be used as a cyclist battalion. Captain Trapmann has told us that for outpost duties cyclists would be invaluable. I agree; I have tried it. I have marched an infantry force through sixty miles of country with a couple of cyclist companies which were responsible for all our screening work, both by day and by night. We frequently see in reading history that the infantry are often marched off their legs, and get on to the battle – field in such a condition that they have not sufficient physical energy left to fight to really do themselves justice. If all the screening work was done for them by their own trained cyclists they would be able to go on to the battle-field fit, because it would obviate the necessity for the marching men being every third night on outpost duty. Fifteen or twenty miles’ march is nothing to a cyclist; he does it so quickly that it gives him ample time to rest and yet do his work at night. It does seem to me that if we are to learn anything from the last two campaigns, one lesson is certainly, that in future divisions will have to march on a very broad front, perhaps on parallel roads ten or fifteen miles apart, and if each divisional general had his own cyclist battalions formed as described, with the infantry cyclist companies under officers whom he knew and who knew him, it would be an immense advantage. They would always be there, whereas if they had to be told off from independently – formed units, the probability is they would not be there at all. I have alluded to the fact of their being there by saying that in 1906 we had from six brigades 1,200 cyclists. I greatly appreciate the value to the infantry of having cyclists with us. Captain Trapmann mentions that cyclists would be sent out perhaps to take up a position for the infantry to attack, and he seems to look upon that with some degree of contempt. I beg to point out to him that no more valuable instruction can be obtained for the cyclists themselves than that they should do so, or that they should be sent on to reconnoitre a position before the marching infantry. I say, send cyclists on to reconnoitre, but let us have our own cyclists to do it – men that know us and that we know, and not an independent party that very likely would not be there at all. Last year, as our cyclist companies were abolished, I officially applied to have a cyclist battalion attached to the brigade in order that I might have the advantage of their services in training my own infantry, and I venture to think that they possibly might have learned some thing-a good deal, perhaps – with us; more, I think, than if they had been taken out by themselves, but owing to the change of system they were not forthcoming. I would like once more to insist upon the desirability of the old plan of a company for each battalion being resuscitated as soon as possible, and I do think with regard to the whole of our Regular Army they will do wisely and well if they institute a cyclist company with every battalion of infantry, with every battery of artillery, and with every regiment of cavalry. Colonel F. W. Romilly, C.V.O., C.B., D.S.D., Commanding Scots Guards:-I did not intend to make any remarks on this paper, but I rise for the purpose of entirely associating myself with the views put forward by Colonel Cave, as to the mistake which has been made in taking away the cycle sections from the infantry battalions. In saying that I do not wish in the least to criticise or disparage the cyclist battalions. I entirely recognise the great value of cyclist battalions, but I think those who are connected with them do not recognise the immense value of the companies which belong to the infantry battalions. When I was in command of a battalion in South Africa I had charge on several occasions of a convoy of 300 wagons, and yet I had not a single mounted man. The fatal range of a bullet is one and a half miles, and of a field gun three miles, and yet I had to protect my flanks and to have an advance guard and rear guard without a single mounted man in the battalion whom I could send to deny the enemy the occupation of ground one and a half or three miles away on either flank. If I had mounted infantry or cyclists I could do it, but I could not do it with men on foot that is an absolute certainty. Naturally the first thing one has to do in such case is to extemporise some mounted infantry or cyclists, so that you can protect your flanks. Allusion was made to the mounted infantry of the Inns of Court, which happens to be a battalion of the brigade I have the honour to command. Personally I consider the Inns of Court Cyclist Company is most efficient. They were always trained – against the mounted infantry company; those two companies were always operating against each other, and I think those two bodies of mounted infantry and cyclists attained a high standard of efficiency, though I admit it is not the same standard of efficiency that the commanding officer of a Regular cyclist battalion might appreciate. Any comment upon the efficiency of the cyclists in that battalion I take as a reflection upon myself as Brigadier. As to the power of cyclists being able to go across country. I attach no, importance, although it may be useful on occasion. I appreciate the value of cyclists in many possible ways, but that is not one of them. I think the author has made a rather dangerous suggestion, in asserting that cyclists are able to live on the country – that cyclists dashing about should go and rob the hen roosts everywhere. I think that would be unfortunate for the troops that followed afterwards. As to the power of battalions of cyclists to make invasions, I think six penny worth of tintacks put down in each village would be very effective in stopping them. I distinctly believe in the very great importance of cyclists in the conduct of rear-guards. I absolutely believe in the many uses of cyclist battalions; I believe in their efficiency and value, I think even to a greater extent than is expressed by the lecturer, but I am not going to indicate all the points because it might benefit those very inferior Germans whom we do not wish to benefit. Lieut-Colonel GILBERTSON SMITH, 25th Bn. (Cyclists), County of London :-I am afraid I stand here to-day as the upholder of the cyclist battalion against the cyclist company; but I must say that if all the cyclist companies which I have had the pleasure of meeting from time to time had been of the same efficiency and quality of training as Colonel Sturmy Cave’s Hampshire battalion, there would be a great deal in what he says. My experience during the past twenty years has included cyclist companies, but unfortunately those cyclist companies in a good many cases did not come up to that standard of efficiency in training which they ought to possess. It is not their fault. 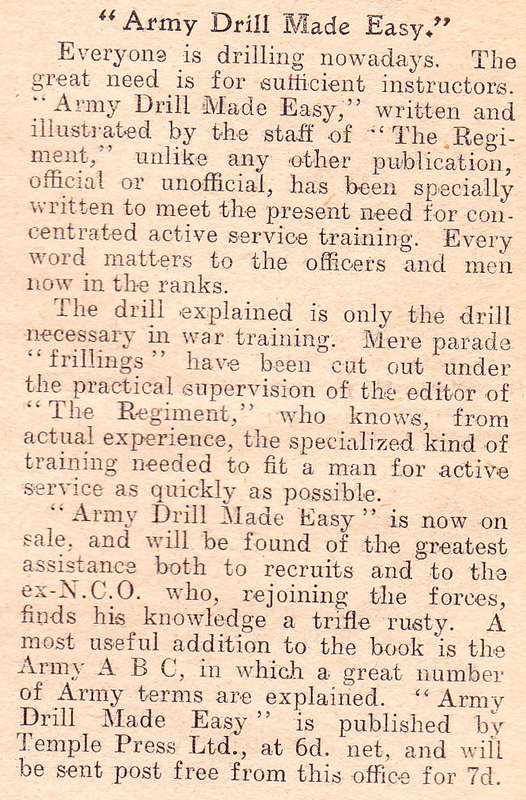 As the lecturer has, said, there was a great deal of difficulty in training the officers, who had themselves to train the men, and in my opinion the cyclist battalion is the only way to really and efficiently train the cyclist, inasmuch as if you get your officer young, as a subaltern, he goes through all ranks until finally as colonel of the battalion he is in a position to know exactly what kind of efficiency he ought to get from his men. At the same time, I should not be unwilling myself to see the cycle sections increased to a certain extent, provided there was any proper machinery for bringing those sections or companies together in a battalion, as suggested by Colonel Cave, on mobilisation. I would like to remind you that the whole essence of Mr. Haldane’s scheme is that every unit should be properly equipped. If you are going to bring together six or eight cyclist companies and form them into a battalion, where is their quartermaster coming from, and where is their food coming from? They must have food; they cannot be expected to go about all over the country looking for that. Who is going to look after the ammunition? Who is to be their doctor? In other words, unless you arrange that the battalion when formed shall have an efficient staff, who in peace time are accustomed to work together, you are going to do more harm than good, any way to your own side, and benefit the enemy, because these men will have no one to look after their comforts and direct them generally. With regard to the remark that was made by Colonel Cave about the Salisbury manoeuvres, I must maintain, with all deference to him, that at any rate on that side of the line on which I was operating the defects of the cyclist company system was very apparent. I do not want to go into details; I simply say that I did notice defects which I will tell him of if he cares to hear them. I maintain that the manoeuvres which we had in East Yorkshire last year, where a battalion together with certain attached companies carried on operations for a week, were far more successful, although possibly on a smaller scale than those held on Salisbury Plain in 1906. I attribute the success not to the fact that I was in command of the operations, but because those attached companies had the advantage of the organisation which the 26th Middlesex Battalion had been trained in for several years past. I cannot agree with the remarks Colonel Romilly has made about cyclists going across country. I know he has had the advantage of war experience and I have not, but from a cyclist’s point of view I can quite bear out what the lecturer said, that the- trained cyclist experiences no difficulty as a rule in getting across country. Then he threw out a suggestion with regard to tin-tacks. I am afraid they would not be considered at all by the trained cyclist, because he is accustomed, if necessary, not even to patch the tyre but to ride on the rim. Therefore the tin-tacks would not much upset him. There is one point on which I do not altogether agree with the lecturer, and that is, I think it is a very great pity that the bayonet has been done away with so tar as the cyclist is concerned. The bayonet is not what it was in the days when I first joined the Volunteer Force, a very long weapon. It is now a very short one, and does not materially interfere with the cyclist. It is not a very great weight on his belt, and I must confess that I think it would be a very great advantage to him in meeting cavalry. There is no doubt about it that, so far as the Territorial Cyclist Battalions are concerned, they will have to meet the cavalry of foreign armies, and I personally think it would be a very great advantage to a man if he knew that if necessary he could slip off his cycle, detach his rifle, fix his bayonet, and then, in the language of the old infantry training, he is quite the equal of any mounted man in a single combat. The bayonet has been taken away; I do not know for what reason. I have found on many occasions in peace manoeuvres that the bayonet would have been exceedingly useful to advance guards or scouts moving in advance, and, I hope I may live to see the bayonet restored as a weapon to the military cyclist. Colonel A. BROADWOOD, C.V.O., Commanding East Midland Brigade – I do not wish to detain the meeting for more than a few minutes, but I rise as an officer who has for the last ten years had a very great deal to do with the Volunteers. I commanded a very large regimental district in Scotland, in which I had 7,000 men, and therefore I think I may say that I am greatly interested in this lecture. I thoroughly agree with what Colonel Cave said as to the companies being taken away from the battalions. I have been the Brigadier of many different brigades, and I have always found that my cyclists were of the greatest help in training my brigade. They were generally the keenest men in the battalions from which they came. That is especially the case in Scotland, where we had very good companies, particularly the Queen’s Edinburgh, a corps of which you have no doubt all heard as one of the best shooting corps in the Volunteer Service. I think in warfare these cyclist companies should never be taken away from the Brigadier; they should be always under his command and used for his own purpose, and not as I gather is the plan now adopted, be massed together for other purposes. I think higher training would be very valuable in these cyclist battalions. I hope that in the future a school may be established through which officers and non commissioned officers serving in cyclist companies can go and get a good training, like the School of Musketry or Signalling, or anything of that sort. I think such a school should be established for cyclists, because they do exceedingly good work, and I know they have the keenest men among them. I have no doubt that the force is being trained better now, but at the same time, it seems to me that we should very much deprecate being deprived of the use of our brigade cyclists, or that they should be massed together away from the brigade, so that when we go into camp or manoeuvres a body of cyclists is attached to us from cyclist battalions of whom, however efficient they may be, we practically know nothing. Major R. A. JOHNSON (Brigade-~Major South Midland Infantry Brigade) :- I should like to add a humble word of hearty agreement with Colonel Romilly and Colonel Cave in their protest against what appears to so many of us to be the absolutely mad abolition of our invaluable brigade cyclist companies. But before doing so, may I say that I do not at all wish – quite the contrary – to depreciate the value of Colonel Gilbertson Smith’s and Captain Trapmann’s cyclist battalion. I have had many a good day with this battalion, and I know how thoroughly efficient it 15. I have no hesitation in saying that, so far as cyclist work proper goes, there never was any body of cyclists who could hold a candle to the London Cyclist Corps. I desire to say that quite frankly and freely, because I do not want there to be any misunderstanding when I now proceed to attack what I may perhaps call excessive esprit de velocipede. It seems to me that what has just happened about military cycling in England is what has often happened before in our Army. We have here a distinct move, and so far a successful move, for the formation of a new arm. There are, of course, properly speaking only three real arms-infantry, cavalry, artillery, but from time to time we constantly see the arrival of what I may call a fourth wheel to the tricycle. I do not want to be very contentious, or to arouse passion in this Hall, but history of the mounted infantry movement illustrates the point I wish to make. Mounted infantry is extremely valuable when used properly, namely, in conjunction with infantry, exactly as the cyclist companies mounted on cycles were used by their infantry, commanders. But as the mounted infantry rose in dignity and usefulness we saw a clear attempt, which has now, I am glad to think been quashed, to form a new arm, cavalry, infantry, artillery, and mounted infantry, and a serious attempt to raise independent regiments of mounted infantry. I think this is exactly what has occurred with the cyclists. The cyclists felt, as the mounted infantry did, the disadvantage, as Colonel Gilbertson Smith has pointed out, of not being always free to develop on their own lines, of always being the handmaids of le infantry with which they are associated. And then grew up a demand among the enthusiastic for independence. A similar movement was made 150 years ago, which culminated in the formation of the Dragoons. ; there was this recent movement, which failed, to form mounted infantry regiments; and now comes this last instance of a declaration of independence by the cyclists, which has for the time succeeded. In other words, Colonel Gilbertson Smith and Captain Trapmann have persuaded the General Staff to deliver the cyclists from their inferior position as the bondsmen or handmaids of the infantry, and to exalt them into something very magnificent, very grand, and very admirable-eleven cyclist battalions, to wit, with the special and honourable duty of being the first to speak-and speak alone-with our enemies in the gate. Referring to what Colonel Romilly said about his South African experience, I should rather like to dot the i’s of what he told you, because I happen to have had the honour of serving under him on the few occasions on which he was permitted to have a few mounted Troops. As he told you, he very often was without a single mounted, man, and the result was that he had to extemporise them. I well remember some gallant Scots Guard’s who were mounted on horses and dignified in the Army List by the name of “Tempest’s Scouts.” General Barrington Campbell, who commanded the brigade in question, did not believe in these extemporised Guards, men; he said he did not want his Guardsmen riding all over the country mounted on horses and looking for all the world like monkeys on sticks; and in my opinion General Barrington Campbell was perfectly right. The proper solution would have been for each Guards battalion to have had with them permanently and in peace time a certain proportion of men who could ride either bicycles or horses, but who were always members of their battalion and under the orders of the battalion commander, not waiting till war came to be formed into a scratch team and receive the dignity of a separate entity and the name of Tempest’s or anybody else’s Scouts. Our argument applies with equal force to the cyclists. Cyclist battalions have been formed as superior beings altogether apart from the infantry., with their own esprit de corps, their own traditions, and their own ‘’monkey tricks,” of which Captain Trapmann is so proud, showing, a fine contempt for all the other arms of the Service and a remarkably good opinion of themselves. This is all very well in peace time, but what will happen on mobilisation for war? Why, of course we shall have the infantry brigadiers calling out for a proportion of cyclists, and Colonel Gilbertson Smith’s gallant battalion will be-broken up into little bits and allotted to the various brigades of the London Division. They certainly will not have the advantage of serving under Colonel Gilbertson Smith or Captain Trapmann. Both of those officers will probably be relegated to duties of Station Staff Officers, just as the colonels commanding the artillery brigades were in South Africa. At such time many special military talents will be entirely wasted, which will be a thousand pities, as they would be most valuable officers if they – could bring themselves to place their knowledge of cyclist work at the disposal of the infantry brigades. Why, in the name of goodness, should we take such care to separate and train permanently away from the other arms cyclists who admittedly when war comes will be redistributed to the units, and who will then be strangers to those units, with bickering and ill – feeling as the inevitable consequence? If every brigade of infantry must in war time have its proportion of cyclists, why should not the cyclists always be trained with the brigades, so that infantry and cyclists may be accustomed to each other when they have t o take the field together in war? I see no reason or justice in the argument that if you take the scattered cyclist companies of a brigade and put them together every year as a cyclist battalion, as the occasion arises, and send them sixty miles to seize some position, and so forth, in accordance with what I may call the ‘STRATEGICAL uses of cyclists, it is impossible to provide such a force when on detached duty with a quartermaster, a medical officer and the rest. Surely the independence of such a detached force can easily be arranged for. We all admit that for training purposes it is very much better that there should be a major or a colonel commanding four companies of cyclists. It is admitted that it is :I most valuable thing that these four companies of cyclists should be trained to act together and should be able to take the field’ together as an independent force for a day or two without having to draw upon other units for transport and supply, etc. Now, if you have one company of cyclist to each battalion that gives you a battalion of four companies to each brigade. Let that battalion be accustomed to make excursions away from the infantry brigade for a day or two at a time; let them have their own quarter master and their own medical officer, and above all their own separate transport; they will then serve the double purpose – the STRATEGICAL purpose of making excursions away from the infantry whom they serve, and they will not at the same time deprive us of what certainly seems to me to be their most valuable purpose, that of being handmaids-a glorious service, although no doubt a secondary service-to the infantry; the eyes and ears of the infantry C.O., the darlings of the infantry brigadier and the infantry divisional general-the people who are sleepless by night and by day, who can bear any amount of fatigue, cover any amount of distance, live on very little indeed, and who, although perhaps worn to attrition during the course of a campaign, will at least have served this purpose : that they keep the infantry quiet and intact for the great day of battle. I have only to add that I have had a good deal of experience with cyclist work on peace manoeuvres, and, interesting and valuable as it is, heaven defend me from ever having to lead one thousand cyclists in a pitched battle. Our business as cyclists is that of being the eyes and ears of the army, to wear ourselves to skin and bone, to do the scouting and the screening; but if you intend to put me in actual line of battle with a thousand bicycles to look after-it may be the fact that I have never been trained in a cyclist battalion, or it may be my tactical good sense I would rather leave the cycle behind and be a plain infantryman in a plain, straightforward infantry fight. In conclusion, we infantrymen have no objection-if it seems good to the General Staff-to the raising of special cyclist battalions for special duties in coast defence, but we do protest as strongly as we dare against the tactical heresies which have prompted the extinction of the cyclist companies and sections, which we know to be invaluable, in order to find the funds for the creation of a fourth arm, the value of which is at least problematical. My genuine admiration of the General Staff and for most of what they are doing for the Army is so great that I have no hesitation in giving it as my opinion, for what it may be worth, that in depriving the infantry brigadiers of their cyclists, the General Staff have made a big tactical blunder, the results of which, when war comes, if not before, they will hasten, perhaps when it is too late, to undo. Lieut-Colonel H. WOOLF (Transvaal Cyclist Corps):- It was far from my intention to join in the discussion to-day, and I therefore made no notes while the paper was being read. The discussion seems to have concerned itself, so far as I have been able to gather, with the question as to whether cyclists should be included in the infantry battalions, as in times gone by, or whether they should be separate units. There are no doubt pros and cons to be considered in connection with each suggestion. For over three years I was captain of a company of cyclists which was attached to the Transvaal Scottish Infantry in the Transvaal, and after that I formed, and to – day have the honour of commanding, a regiment of cyclists. The difficulty when we are joined to the company is one which has already been stated, that the commanding officers neither appreciate the proper uses to which the cyclist should be put, nor do they know, when it comes to field day or camp, or anything of that kind, what to do with them. We were invariably utilised either as scouts or despatch riders or something of that kind and I do not think we were put to the legitimate uses to which we were entitled. On the other hand, for four or five – years my experience has been that whenever any quick work had to be done, whenever there was an important position to be taken, and whenever there was any night work or anything that required a certain amount of discrimination and at the same time -despatch, we, as cyclists, were invariably selected for that work. The reason, I take it, was that in the first place I had always had the men trained thoroughly as infantry before ever they were taught to mount a cycle, or at any rate, to, make a raid on a cycle. They thoroughly understood how to use their rides, and latterly how to use their bayonets. The consequence was that we first had a I trained soldier in the ordinary accepted sense of the term. Then when we came into action we were always placed either on one flank or the other, as the case may be, and it invariably happened. that we not only outflanked those to whom we were opposed, but we were able to get entirely in their rear and prevent them from retiring when they desired to do so, we had them entirely rolled, up, as it were, in a bag. I am, therefore, of opinion that while it is desirable that the infantry regiments should be served by cyclists, not as a company but in a limited number, yet I maintain that if the cyclists are properly utilised, there is no question as to their utility in actual times of stress. As has been so carefully explained to you by Captain Trapmann, when it is needed we can, move infinitely’ more rapidly than the cavalry, and at the same, time we are comparatively fresh at the end of the work, provided it has not been too severe, and that we have not, as we often have to do in the Transvaal, to move too long a distance over the veldt, which is exceedingly hard work. It is somewhat late now, and while a good deal more could he said in connection with this subject, I do not think it is wise to weary, you by going into any more details. I hope, however, an opportunity will be given before I return, at the end of January or February, whereby this subject, which ‘is open to a great deal of discussion, may be further ventilated. Major J. M. BESANT, Brigade-Major, Norfolk and Suffolk Brigade:- In order to obviate prejudices of other branches of the Service against this, the youngest, excrescence, it is perhaps necessary to constantly define its functions clearly, and to show that its existence does not encroach upon or interfere with their functions, but fits in with them. The first, and to my mind the most important, duty of cyclist units is that of observation, combined with defence, of all assailable parts of our coast line, assisted by the local Coastguards, ex-Coastguards, fishermen, and any who can be found capable and willing. On the very first alarm (the personnel of cyclist battalions being already detailed for their coast war posts), it should be possible by a simple scheme, of which I have collected details, to assemble those units at their posts within a few hours, and to maintain them there if necessary for at least 14 days without camp equipment or commissariat, and with a minimum of motor transport. This transport should provide for such services as supply of ammunition, repairs, medical aid, and transport of staff. Superior mobility being the prominent feature of the cyclist soldier enables him to mobilise and to concentrate very quickly. In coast work their principal duties are for harass and delay a landing or an advance inland, if not to prevent it, and to gain time, so valuable for the general mobilisation. No more favourable opportunity for this is likely to occur than if an enemy crowded in boats were opposed by some hundreds of riflemen posted under cover near a shore line. To take full advantage of this opportunity it is the duty of cyclist battalions to have a thorough knowledge of the coastlines allotted to them, which can only be gained by constant study of them and local training annually. I speak only of, experience gained in the county of Norfolk during the past eight years. Chapters III and VII of “Cyclist Training” give general ideas of this work. General Sir Arthur Wynne gave, the Norfolk cyclists their first opportunity, of testing there powers of concentration to oppose a landing. An attacking for’ was represented by two gun boats. Some 40 miles of coast was the defined object on which their attack might be delivered at any point. The point of attack was discovered, and the concentration of three quarters of the force of cyclists was effected twenty minutes before the boats of the attacking force could have got ashore. The movements and position of the cyclists were quite unknown to those on board the gun boats. For watching a coast line by night, I have, in consultation with local Coastguards and fishermen, arrived at the conclusion that another system should be adopted, details of which I had better not go into now. As regards the tactical employment of cyclists and their use with cavalry, I think the remarks of the lecturer are valuable as a guide to further training. It is well to remember that the action of cyclists as a rule is locally defensive. 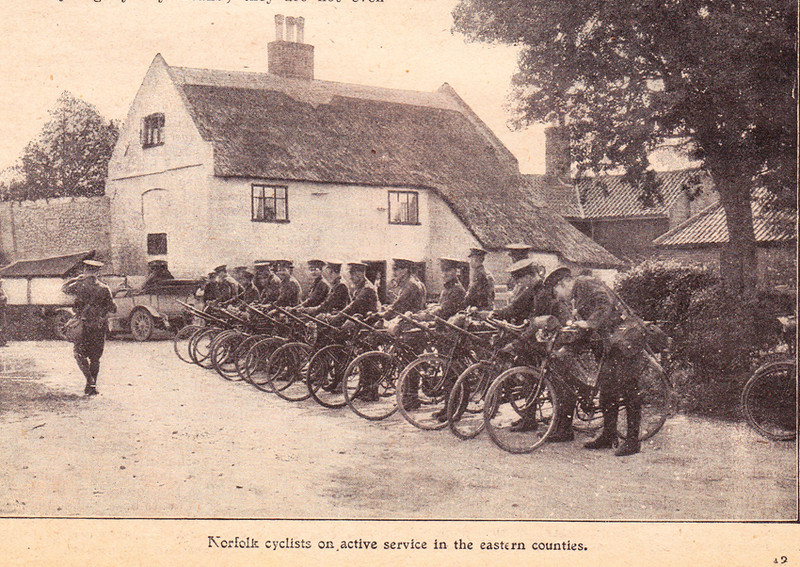 In 1904-1905, the cycle companies in Norfolk were trained under mounted infantry officers, from which they derived great benefit. I do not quite agree with the suggestion that the intervals and distances on the march be decreased. The speed at which cyclists can close up should counteract the disadvantages urged. Also with the larger intervals, bodies of cyclists can move more safely and at a higher speed. Referring to the comparative value of our Territorial soldiers to that of foreign conscript soldiers, it is not in the ranks that the balance lies against us, so much as in the superior discipline and science of the commissioned and non – commissioned ranks. I believe the motor cyclist for general purposes to be the best means in this country for communication in the field. Whatever the training of, the cyclist soldier is, it should essentially be framed to work in with that of all other branches of ‘ the Service; but I maintain that the first and most important duty for, which they have been called into existence, is on the coast-to harass and delay an enemy, and so gain time for the mobilisation of all for defence. Captain A. H. TRAPMANN, in-reply, said:-Those who have addressed the meeting have, I think, instead of criticising my lecture, rather contented themselves with criticising the action of the General Staff in ,abolishing cyclist companies. I believe Major Johnson imputed to me that I had induced the General Staff to do so. I plead: Not Guilty. As there appears to be no member of the General Staff present who wishes to defend them, I, having no brief for the General Staff, can therefore say nothing. We must take the fact as we find it. I thoroughly agree with all the speakers who have referred to the subject, and hope that in a year or two we, shall have not only cyclist battalions, but cyclist companies. A beginning had to he made somewhere, however, in the Territorial Army, and if we have not got money for both, we must for the present be content with the battalions. The General Staff thought they had sufficient work to do for at any rate ten cyclist battalions. They may, of course, be totally wrong – I do not know; but it is to be presumed they had work for them, and they therefore created them. They thought they had not got any work for cyclist companies at present, so they have left them uncreated. As I say, it is not a question for me to discuss at all. There is one other point I should like to draw attention I should be extremely sorry if Colonel Romilly took my remarks as any sort of criticism of the troops in his brigade. I think he could not have heard me correctly, or that he misunderstood my meaning. The only reference in the paper to the Inns of Court (who, by the way, are very old comrades of ours), was with regard to the old 26th Middlesex; I said that the 26th Middlesex were hot included in the C .I. V. Cyclist Section, because that Cyclist Section was formed from the Inns of Court V.R.C. I do not know how any aspersion upon the Inns of Court could be read into that. I should think that, considering they were selected to form the Cyclist Section of the C. I.V., it would hardly be possible to do them a greater honour. Colonel ROMILLY:-That, I may say, was meant for a joke. Captain TRAPMANN:-Yes; you can hear your tyre bursting at night as well as in the daytime. Even when they are passing over broken glass you will see the files moving off to the -right or to the left. I think it is only fair to give cyclist battalions credit for having ground scouts sufficiently trained to warn their comrades that tin-tacks have been thrown on a certain section of the road. If the ground scouts of any company I was in charge of told me that several tons of tin-tacks had been strewn on a certain section of road, I should merely go through the hedge and ride the next half mile on the fields, and come out on the other side. Colonel ROMILLY:-I said “every village,” but it was said as a joke. The CHAIRMAN (Brigadier-General Sir H. S. Rawlinson, Bart., C.V.O., C.B. :-It rests with me to sum up the very interesting discussion we have had this afternoon, and perhaps to some extent to pour a little oil upon the troubled waters. I do not know that I am very competent to deal with the subject of cycling, though I learned to ride a bicycle a great many years ago, I think in 1875, when I was a boy at Eton, and I have ridden a good many thousand miles since then. Perhaps I am not quite, qualified to be considered a really “trained soldier cyclist,” but I at the same time I have seen a certain amount of cycling work, and various points have been raised to – day with which I cannot thoroughly agree. The discussion has turned mainly on the question as to whether cyclists of the Territorial Army should be trained by battalions or by companies. The organisation which the General Staff have laid down as most suitable at the present time is that of battalions, and I think they have done so for a specific purpose. The Territorial Army, as created by Mr. Haldane, has been initiated for home defence, and I gather that these cyclist battalions have been formed at certain selected centres for the purpose of moving rapidly to dangerous points upon the coast, with a view to defending those points at the very earliest possible moment in cast of danger. I know I am right in saying that that is the reason the cyclists of the Territorial Army have, for the present, been organised into battalions. I do not say that that is necessarily the best arrangement, because from the experience I have had in working a brigade of infantry, I look upon a limited number of cyclists with the brigade as indispensable. I am not sure that a company is not perhaps too many, but I am sure that, in so far as the brigade organisation goes and we are all organised into brigades – a certain number of cyclists are absolutely necessary as the eyes and ears of that force. I would especially lay stress upon what fell, I think, from Major Johnson, that the cyclist however enthusiastic he may be – and really if the cyclist is to do all the lecturer claims for him he must be Admirable Crichton – however expert he may be, both in fighting, shooting, reconnoitring, and everything else, he must recognise that he is merely an auxiliary either to the infantry of the cavalry. Both from a tactical and organisation point of view the cyclist cannot be a forth arm. The infantry is the backbone of a military force. It is the infantry that wins your battles. The artillery is there to help the infantry, the cavalry is there to protect the infantry and obtain all the information possible; but it is your infantry, and your infantry alone, that wins decisive success, and the cyclist as an assistant to that infantry is certainly a very valuable adjunct. There is one small point which curiously enough has not been brought out with regard to the cycle, and that is that the cycle – does not eat. For this reason the cycle is particularly useful in over sea expeditions, especially with a force that has to land on an open beach, where horses cannot be put ashore, and where the supply of grain for animals is limited. In such cases cyclists would have to take the place of mounted troops, and might be of very great value. It is getting late, so I will not refer to several other points to which I should have liked to call attention, except this last one. It has been suggested that cyclists may take the place of outposts. I should be very sorry indeed in war to trust to a few standing patrols of cyclists pushed out at long distances in front of a camp or bivouac. I know too well how liable standing patrols are to surprise, .and in the event of surprise how impossible it is for anyone, even a motor cyclist, as the lecturer suggested, to get away and give the alarm. If once one of those standing patrols is surrounded and captured-and this is by no means a difficult operation-there is nothing to prevent the enemy walking straight into your camp without any notice at all. Hence I strongly deprecate their use instead of outposts, though they may be of great use particularly at night as message-carriers and for reconnaissance. I would like, on your behalf, to propose a vote of thanks to Captain Trapmann for his extremely interesting and very elaborate lecture. This article is reproduced in its entirety from the ‘Journal of the Royal United Service Institution’ ‘1901 vol. 1’ – The Cycle in Warfare – a lecture given by Capt. A. H. Trapmann. It is published on the website http://www.huntscycles.co.uk/Trapman%20-%20History.htm, in its entirety, with the permission of Adrian Johnson, Deputy Editor, RUSI. I am indebted to Martyn Smith and the website http://www.huntscycles.co.uk/Trapman%20-%20History.htm for making this article available. It offers superb insights into the role of cycles in warfare, and the attitude to them, in the early years of the twentieth century – an essential part of this website.